Robert Redford is one of Hollywood’s enduring men of mystery. Even in the lesser roles in his six-decade career, there has always been a strong suggestion of unplumbed depths behind those appropriately ocean-blue eyes. In his greatest films—Butch Cassidy and the Sundance Kid, All the President’s Men, All is Lost—he suggests layer upon layer of quiet complexity, combined with clean, compelling honesty. Even when he plays a crook, you trust him. This quality is crucial to his latest—and purportedly last—film as an actor, David Lowery’s The Old Man & the Gun. Based on a New Yorker article, The Old Man & the Gun is the story of Forrest Tucker (the name is apparently not an hommage to the star of F Troop), a septuagenarian bank robber who goes on a mini-crime spree in Texas in the early 1980s. Although Tucker carries a gun, he never uses it; he gets what he wants through a combination of charm and, shall we say, a firm sense of purpose. The managers and tellers of the banks he robs describe him invariably as a gentleman. Indeed, we see his courtesy from the very first sequence; escaping from a heist, he stops to help Jewel (Sissy Spacek), a farm widow whose pickup truck has broken down. The police cars speed by as he checks under the hood. This scene is, of course, the beginning of a low-key romance between Tucker and Jewel. Eventually, Tucker decides to step up his heists to get money to help Jewel pay her overdue mortgage. (Jewel doesn’t even know, at least initially, that Tucker is a bank robber.) Meanwhile, the Dallas PD is in constant pursuit, led by Det. John Hunt (Casey Affleck), a cop just as laid-back and likable as Tucker. But The Old Man & the Gun has only one reason to exist: Redford. 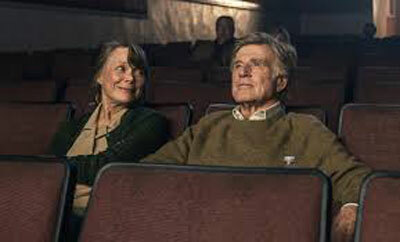 Still breathtakingly handsome at 82, Redford makes Tucker compellingly ambiguous, combining a twinkly, old-guy warmth with a maverick’s unpredictability. The look in his eye as he romances Jewel isn’t much different from the one he has when he leads the cops on a chase. For Tucker, living well and living dangerously is exactly the same thing. 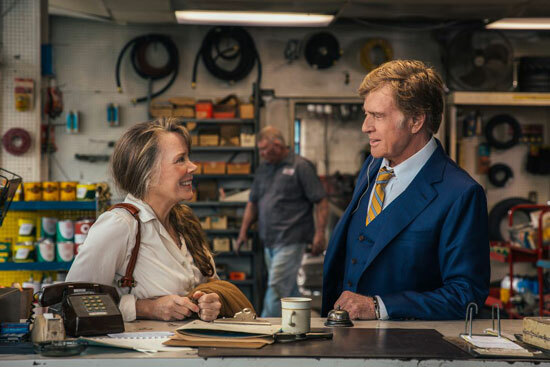 One of the biggest hits of Redford’s career was The Natural, Barry Levinson’s 1984 film, which also made Redford’s leading lady, Glenn Close, a household name. Though never quite as big a star as Redford, Close has become one of the most revered actors in American cinema. Her latest film, Bjorn Runge’s The Wife, amply demonstrates why. Written by Jane Anderson from a novel by Meg Wolitzer, The Wife begins in the bedroom of Joan (Close) and Joe Castleman (Jonathan Pryce) on a very early morning in 1992. Joe is a celebrated and notoriously self-involved novelist; Joan, formerly one of his literature students, has spent the last forty years nurturing his ego and keeping the vulgar world at bay. The phone rings, and at first Joan and Joe think it’s a prank, but the call comes authentically from the Swedish Academy: Joe has won the Nobel Prize. The story proceeds to the Nobel ceremony in dead-of-winter Stockholm, with flashbacks to the college where student Joan (Annie Starke) and teacher Joe (Harry Lloyd) first met. We see that Joe loved to pontificate even as an assistant professor; later, as a literary superstar, he is an ardent adherent of Victor Hugo’s dictum: “C’est moi qui parle!” He starves his son David (Max Irons), an aspiring writer, for both parental and literary approval, even as Joan assures David his writing is excellent. Joe also does not consider fidelity an essential component of marriage, and he acts on this conviction everywhere, including Stockholm. Meanwhile, Nathaniel Bone (Christian Slater), a writer on the make who wants to write Joe’s official biography, confronts Joan in Stockholm with a few facts about Joe and Joan he has pieced together. The Wife is a hushed, muted film (more than one reviewer has called it Bergmanesque) that seems to take place in perpetual twilight. Because of it, we feel the maximum shock of Joan’s explosive rage at film’s end. 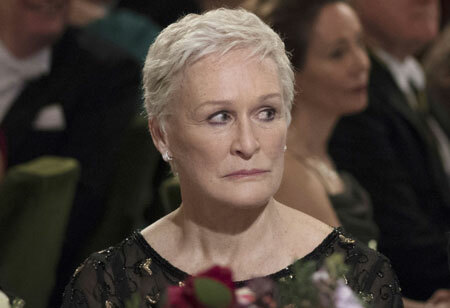 But we aren’t unprepared, thanks to the exquisitely delicate, nuanced performance of Glenn Close. We already notice signs of unease in Joan’s demeanor in the early scene in the bedroom; later, as Bone interrogates her in a Stockholm bar, her face remains composed, but her eyes flicker with ardent, long-suppressed emotion. Close’s performance builds masterfully, in almost imperceptible increments, to a shattering crescendo, with a quiet coda serving to underline the depth of her accomplishment. The Wife is carefully made, and all the performances are fine. Pryce, no stranger to playing literary lions (his Lytton Strachey in Carringtonis still the best performance of his film career), has a high old time as Joe Castleman. But without Glenn Close, The Wife—like Joe Castleman—would be much diminished. Ryan Gosling was four years old and Claire Foy an infant when Redford and Close appeared in The Natural. While Gosling and Foy don’t monopolize their film together, Damien Chazelle’s First Man, the way Redford and Close do their latest movies, they provide a considerable amount of its impact, and also provide assurance that the thespian art will continue in good hands into the next generation. With a screenplay by Josh Singer from a book by James R. Hansen, First Man is the familiar but still thrilling story of how Neil Armstrong (Gosling) became the first man to set foot on the moon. Chazelle throws us into the action headfirst, with a terrifying supersonic plane crash at the outset. Armstrong is in the cockpit, and while everything around him is literally falling apart, he himself is totally, almost eerily calm. If you needed a demonstration of The Right Stuff, here it is, right in front of you. Ironically, Armstrong’s superiors weren’t so sure at the beginning that he had The Right Stuff; experts such as Chuck Yeager openly questioned Armstrong’s competence and judgment as a pilot. First Man is the story of how Armstrong came to gain the confidence of NASA and be designated captain of the Apollo 11 mission. Concurrently, it is also the story of the dangers the astronauts faced—exemplified by the January 1967 pre-launch fire that killed Gus Grissom, Roger Chaffee and Ed White—and the near-constant anxiety their families suffered. Even more than such films as Apollo 13 or Gravity, First Man brings home to an audience the terror, and the exaltation, of space travel. Aided by his usual team including cinematographer Linus Sandgren, editor Tom Cross and composer Justin Hurwitz, Chazelle makes us feel that we are seeing what Armstrong saw when he stepped onto the moon, and feeling the overwhelming awe that Armstrong and his crew must have felt. First Man has come in for its share of drubbing, all of which I think is unsound. Some critics have said the film comes to life only in its scenes in space. To this I can only say that First Man, a film of two hours and twenty minutes, seemed half that length to me. Some right-wingers have condemned the film for not making a big deal of Armstrong planting an American flag on the moon. But Chazelle—showing the astronauts, the lunar module and the flag as tiny figures in a landscape of mind-boggling vastness—obviously had another, more universal point to make. Also, the film does make a big deal of Armstrong’s son raising Old Glory at the family home. This scene makes any accusations of unpatriotic sentiments disingenuous at best. 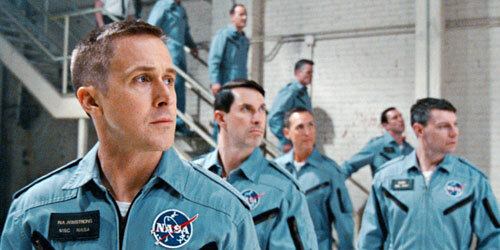 Above all, I disagree with those critics who say Gosling’s performance as Armstrong is impassive. It is true that Gosling’s Armstrong keeps a straight face most of the time; he has one big emotional scene, not far into the film, and no fair saying why. Not to make Armstrong a center of calm would have been untrue to the man, and to say that Gosling isn’t compelling in portraying that calm is a slander. Like Robert Mitchum, Gosling is an actor in whom still waters run very, very deep; like Spencer Tracy, he can tear your heart out without appearing to do much of anything. In First Man, you can’t take your eyes off him. Claire Foy is just as praiseworthy as Armstrong’s wife Janet. Foy, of course, is best known for playing two very different English queens: Anne Boleyn in Wolf Hall and, more famously, the young Elizabeth II in The Crown. Here, Foy is 100-percent American, but English actors doing perfect American accents have become almost a cliché. What distinguishes Foy’s performance as Janet Armstrong are her fierce love for her husband and family, matched by her equally ferocious integrity. She is willing to sacrifice much for Neil’s sake, but she will not gladly be his widow, and the scenes of conflict between Gosling and Foy have enormous intensity and emotional truth. The cast of First Man is replete with fine actors, including Kyle Chandler, Ciaran Hinds and Corey Stoll, but Gosling and Foy are the ones you will remember. By the time you reach the film’s final scene, with Gosling and Foy’s hands touching through the glass partition of a NASA isolation chamber, you will know you have seen two great actors giving remarkable portrayals of courage and devotion—the kind of courage and devotion on which America was built.